It was 85 degrees outside yesterday in Massachusetts. Yes, it's still April! Summer is coming, fighting with spring each day. I can't wait to get out to the beach with Eliana. Surprise, I am not actually a beach fan myself - but I love to see her face when she is playing with the waves and sand! We never had a sand play set last summer, she was only 6 months old. This summer on the other hand she will be digging through it and the Green Toys Sand Play Set that was sent to us for testing is just perfect for the occasion! DESIGN: What a simple design this is. Just like toys should be. I can't help but notice the nautical vibe from the pail with the rope for a handle. Looks and functions a lot better than a plastic or metal handle in my opinion. I love that the colors are not screaming primaries. It's very subtle and will look beautiful at the ocean, the light blue, green, and orange. You'll find no excessive packaging here, just one piece of recycled cardboard holds everything together quite well. The only thing I would change about the design, which really is just a preference, is the hollow underside of the shovel and rake. I wish it was covered with some plastic on that side, even though it is an unnecessary use of material. The way it is designed now, it is hard to get sand and dirt out of those small nooks with the criss cross plastic that is there to make it rigid and sturdy. If that was covered it would be a lot easier to clean. It is also well priced for an Eco-friendly toy - which tend to be more expensive for reasons I have yet to understand. The entire set will cost you anywhere from $15 to $20 depending on where you buy it. That's a small price to pay for some intense beach fun with your kids! ENVIRONMENT: Here is where this Sand Play Set really stands apart from all others. Not only is it made in the USA (in California), it is made entirely from recycled milk jugs collected curbside. The plastic material is high-density polyethylene and it is one of the safest plastics around. This is one of those times I will not mind a plastic toy, especially that it is not from China. So if you live in California, this is as local and green as it will get! Though if you are from elsewhere, like me, they have enough to go around for all beach loving families coast to coast. 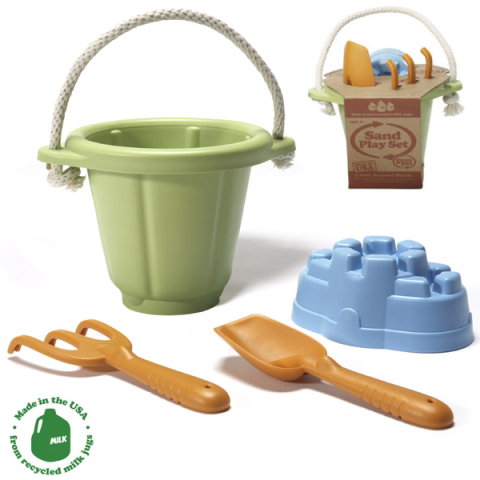 One Eco-Babyz reader will be a proud owner of the Green Toys Sand Play Set! MANDATORY ENTRY: Go to the Green Toys website and tell us in a comment which other toy you would love to buy. 2. Sign up for the Green Toys email updates. 4. After you join the Eco-Babyz community, add a profile photo and post a thoughtful review of your favorite green baby product (4 entries). You can also become an Eco-Babyz or Green Toys fan on Facebook, but this will not count toward an entry because of new Facebook Promotion Guidelines. Contest ends at 11:59pm EST on Monday, April 19th. The winner will be selected using Random.org on Tuesday April 20th and notified by email (make sure I have a way to get in touch with you!). Open to US residents only! Thank you! My nephew would go bonkers for the dump truck! The tea set would be a hit in our house. I like the jump ropes. I would love to get the Blocks for my nephew! He's a little construction man! I follow @EcoBlogz on Twitter! 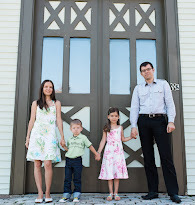 I joined the Eco-Babyz Community on Lunch.com! I follow Eco-Babyz on Google Friend Connect! I love the Dump Truck. It looks so sturdy. I have tea set (and love it) but my daughter really really wants a dump truck! I would like the Tea Set. I would choose the BPA-free Feeding Bowls (4 pack) - not necessarily a toy, but much needed! We have their tea playset, which our daughter loves! Thank you so much. Each day, as I pick my 2 & 1/2 year old daughter up from school, I ask her what she did that day... and she always says, "I JUMPED!" So, when I saw the jump rope on the Green Toys website, it had her name all over it. My daughter would love the tea set! She loves throwing tea parties but this is much better than mommy worrying about her mugs! The Blocks for tiny hands sounds great, I love the color and size! They can be used for counting and pattern recognition too, and other games! I think the Recycling Truck is super cool! I really love the dump truck too! I love the recycling truck. Signed upt for Green Toys email updates. I like the jump rope! My daughter chose for me, she really likes the "dish set." My daughter loves to make me fake breakfast, lunch, and dinner. And of course...I love to eat it! Thank you very much for this opportunity! God Bless one and all! I love the complete dinnerwear set! The Jump Ropes are cool! My kids would love the jump ropes! I like any of the trucks. (OK, actually my son would). My daughter would love the Dish Set! I like their BPA Free Plates! I would also love to get the dump truck for my son. Thanks for the giveaway. I saw their tea set in the Pottery Barn Catalog and fell in love! I have purchased both the tea set and the dump truck and they are excellent products! I would also like the Recycling Truck for my grandson. My daughter would like the tea set too! I like the Indoor Gardening Kit! My boys would love any of the trucks! I love the dump truck for my three boys! The Chef Set looks great! We'd have lots of fun with the Indoor Gardening Kit. I would love to get the Tea Set. The tea set is really cute. I would buy the dump truck. I love the tea set. I really like the Cookware and Dining Set.Thanks! I think my daughter would love the tea set from green toys. I like the Indoor Gardening Kit for my kiddos! The kids would love the Indoor Garden Kit! My son would go bonkers for the dump truck! I like the dump truck!